Combining its roles at the second largest city, the island's main port, the centre of the wine industry and a bustling holiday resort, Lemesos emerges as a spirited and cismopolitan seaside town. Lemesos is a lively town largely due to the character of Lemesolians, a fun-loving lot. No wonder it holds the island's two top festivals, the pre-lenten Carnival wih fancy dress balls, parades and festivities and the Wine Festival in September, a wine extravaganza where wine flows freely for everyone to enjoy, courtesy of the local wineries. 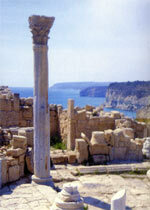 Lemesos emerged out of the two most important ancient city-kingdoms, Amathous, to the east of the town, and Kourion to the west, both of which are being extensively excavated. 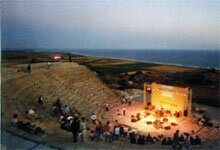 The magnificent setting of the ancient Kourion Theatre is used for summer concerts and theatrical productions. In the middle Ages, Lemesos hosted the marriage of Richard the Lionheart with Berengaria of Navarre from whom he crowned Queen of England. Thereafter the Crusaders made their headquarters at the Square keep west of the city, known as Kolossi Mediaeval Castle, where they fostered the amking of wines, particularly the sweet dessert wine "Commandaria" - the oldest named wine in the world. Today Lemesos, is a resort with a ten mile coastline, a busy shopping centre, countless tavernas and restaurants and a night life to suit tastes ranging from modest to sophisticated. Cyprus Mediaeval Museum, the District Archaelogical museum, the Folk Art Museum, the Lemesos Municipal Art Gallery, and the Municipal Gardens. Also in the vicinity are the placid Germasogeia dam, frequented by keen anglers, and the Salt Lake of Akrotiri, home of thousands of migrating birds in winter, and a stopover point for millions more as they wend their way to different climes in spring and autumn. In nearby foothills, delightful villages continue the gentle pace of rural life.